I understand the stylesheetparser is designed to only work with classes assigned to elements. 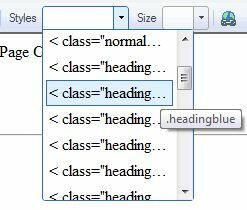 The problem is not the stylesheet parser, but the fact that the Styles system in CKEditor is meant to be used with known elements, it doesn't allow to create a generic Style that can be applied to any element. So that little trick with the parser is useless, you need a far bigger change to do what you want. I can see exactly what is happening... it is using the defined element to create the html in the dropdown box... problem here is that there is no defined element. I see a real easy fix, when no element is defined, use a span tag. This way the dropdown list will look correct. What happens if you try to use such style is that a span is generated, the class isn't applied to the existing element. That would have been generated if the class was really applied to the table.